Naoki Yoshida (Yoshida) : Thank you very much for coming today again, the Japan Expo is a very busy place but we're glad to see you again. So rather than me starting, I'm sure you have a lot of questions, I think it's good if you start asking questions, so please, let's start. Mondes Persistants (MP): Regarding new players, what kind of content will they tackle in order to progress into the game? What about current players who already have all jobs to 50? Yoshida : Actually the reps are posting about it on the forums, but we are trying to have the best leveling features, and for 2.0 it is going to be quite different from the current leveling system. When I started working on XIV, I wanted to make the changes straight away but we couldn't because there was a lack of contents, and also the system wasn't ready, but for the 2.0 version I want to make sure once you complete contents, you will get the key to level up your character, so completing content is a key to leveling up in 2.0 version. Completing the quests, getting rewards, huge experience points, or completing a dungeon and getting experience points, that's going to be the key thing to level up your character, not like at the moment where you have to do monster camping or farming, that's not going to work in 2.0. For the new players, once you make your character then you start going into the storyline, experiencing the scenario, and completing quests, you will not really progress in the game, you would gain experience points and level up your character first, once you've experienced the storyline, you will realise that your character is leveling up at the same time. For the level 50 players, of course they can try out the new main scenario of 2.0 and complete the battle against the Garlemald Empire, or try out the new Crystal Tower content; so, you can start trying out the end content if you want to, or, of course, if you can try the new scenario from scratch, there'll be several options given to players. Also the map is completely different so just by walking around you'll notice a lot of new things, that should be interesting as well. Finalfantasy14.eu (14EU) : Have you done any tests on the latency for the version 2.0? I suppose that you've noticed that the Garuda Battle has not really been taken on by European players because of latency. French players think that the Ifrit Extreme is impossible to complete due to latency issue, and they are afraid not to be able to do the relic quest before 2.0 hits. Yoshida : We have completed the tests and research, and we did find out that the whole issue is based on the access route: there's some packet loss, and this is the cause for the lag European players face. We are going to make sure not only French players, but all European players can have a great experience for the 2.0 version so please wait for an announcement we will be making in the future, we can't address it at the moment but we're definitely taking steps to make sure this will be solved, please be reassured. JeuxOnLine (JOL) : For the 2.0 version, with the arrival of free companies, what will become of the linkshell system? Yoshida : We'll keep the linkshell, so players will have several linkshell pearls, they can talk to their friends whenever they want to like a chat community system, while the Free Company is more like a guild, you can't be in several guild, you can only select one Free Company. You can have several linkshells, it's more casual so that you can chat with your friends, while the Free Company is more like a strong community, you have to stick to one. JOL : I would like to ask as well, about the Free Companies, basically, you're saying that it is a guild, the lower level players won't be having a Free Company, will they? Yoshida : It's not only for the high level players, if the guild already exists, you can recruit level 1 players, and we will also have a Mentor system, higher levels can guide and teach the new players, and if you help the new players, you will get rewards so it will be good for your Free Company as well. We would like to encourage you to help the new players so this is going to be a really good balance, not only for the high level players, but low level players can enjoy and benefit from this system as well. That being said, even if you're not belonging to any Free Company, that doesn't mean you can't enjoy the functionality, for example, [myself] and Sundi have their own Free Company, [we] can still invite someone else as a Guest, and [we] can help him to complete one particular content, so don't worry, even if you don't have a Free Company, you can still enjoy the game. MP : Today, a lot of MMO are using voice over and cutscenes in their quests, even in small quests, what about Final Fantasy XIV 2.0 ? Yoshida : For the main quests and the main scenario, we will going to have full voice over, not only in English but in French, German and Japanese as well. However, we have a concept not to voice over the general quests. The reason we decided not to voice the normal quests is because we believe having more quests is the most important thing; if we want to have an update every two months, and let's say, we add 200 quests, and if we want to have voices in four languages over these 200 quests, it's going to take four months to do the voice over. Rather than spending time in voicing these quests, we wanted to keep adding more small quests but we will make sure the main story line will have full voice over. MP : Can we choose the voice language in the options? Yoshida : Yes you can. We had to make a choice, do you prefer having 10 quests with a four-language voice over or 200 quests in each version update? Most likely, you will want the 200 quests. 14EU : Can you tell us more about the PS3 interface? Why are you afraid to show it? Yoshida : Please wait a little longer, maybe some time at the end of summer, we will be able to show you the PS3 user interface. However, today we have something to show you, we haven't shown the public yet but 2.0 is working on this [Yoshida's] laptop, so you can have a sneak peek today. You will see the PS3 UI is going to be quite different from the PC's. To make sure the gamepad can do the same things even without a mouse, we made sure to do two separate interfaces, the UI you choose will going to be quite different. Mouse and keyboard or gamepad. JOL : Before releasing primal fights or dungeons, who run the test? I mean, who clear them first? And then, who get the records on the speedruns, for example, there are some dungeons run in less than 25 minutes. Who hold these records? And how about Ifrit Extreme? Who cleared it? Yoshida : (short laugh) On the same floor with the dev team, there are 10 people dedicated to Battle QA (Quality Assurance) who test the battle system, and they continuously QA it. Of course, when there's a major update, there will be like 60 people doing QA altogether, but there are 10 dedicated battle QA specialists, they're sitting next to the dev team, and they give feedbacks straight away. That being said, the number of challenges the QA members are doing is much less than what the players are. That's why I'm always telling the dev team and the battle QA team: "if it's easy for you, it's going to be too easy for the players, they're going to clear it under 30 minutes, you have to make it more difficult". Whenever the battle QA team clears a content, I tell them: "that's not good enough, we have to make it more difficult! and keep it more complicated, more challenging!" That's how we adjust the balancing. The reason behind that is because we need to respect our great gamers, we know they're really good gamers, that's why we have to make sure the battle system is fun. In terms of strategy and time in order to clear a battle, the players are much better than the QA team. MP : Regarding the Gameplay, what should expect current players when 2.0 gets released? Are changes planned regarding the battle system or synthesis? Yoshida : For the battle, it's going to be really faster and speedy, you will be experiencing a completely new game. Combo routes are changing and also, Battle Regimen which we have stopped for the current version, we'll bring that back in the new version. That's going to be really dynamic and completely different. Not only the new combos, but also the current contents like gathering, synthesising, it's going to be completely different, I'm sure you will enjoy the new experience. 14EU : What will happen to the relic quest in 2.0? Will Ifrit Extreme still be a mandatory step? Yoshida : Yes, the Ifrit battle will be mandatory. But we do understand that there is a lag issue concerning the European players, so we're making sure to take the steps to solve these issues. When 2.0 comes out, you shouldn't be experiencing the lag, please rest assured. JOL : I suppose it's your first Japan Expo. All these people here for Japan, its culture, its video games... how do you feel? What do you think about French having strong feelings for Japanese culture? Yoshida : I feel really happy and lucky to have this enthusiasm among the people in France, not only for games, but for animes, mangas, and all these sub-cultures, especially when I saw all the traffic this morning, it's quite impressive and amazing. I'm really happy to travel not only for France, of course, but for the whole European players, I really want to continue to introduce FF to all the audience here. MP : Can we expect more diversity in-game between players such as more mounts, more unique armor sets for jobs, more pets than chocobos? Yoshida : Absolutely. It's a short answer but it means everything. We will definitely bring you lots of stuff, I'm sure you will be excited. 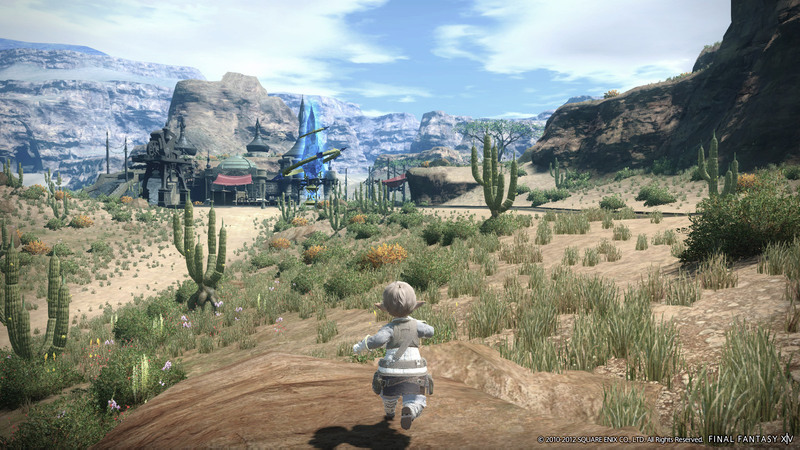 14EU : In version 2.0, will maps be as huge as in Final Fantasy XI? Yoshida : It really depends on the case, just because the maps are large doesn't mean the game will be exciting, we have to have contents inside areas. That's our main focus, to make sure there's enough adventure in the area, we're not really focusing on making huge maps, repeating the same sceneries is not interesting, 2km on 2km is something we try to keep in mind, but even the current biggest map is not reaching 2km yet. It's still growing, but it's going to be addressed later. JOL : About the relic weapons, we didn't hear about them for a while. Let's say, one day, you raise the level cap, and then weapons will become useless. Will they be upgradable? Especially because we ask players to go through such a huge challenge to get the weapons, so we don't want to introduce something new and make your efforts go away. We will definitely have an update, it really is a special item. Short presentation (about 10 minutes) of 2.0 on Yoshida's laptop. This part was not planned, I cannot recognize anyone's voice except mine (and sometimes my colleague's), my apologies for the anonymous talking. Yoshida shows his character running around a forest, next to Gridania. It is quite gorgeous (and quite green in fact), the detail level is impressive. It is way livelier than the current Gridanian forest, the colors are much brighter. Yoshida's character is a fully-armoured male Miqo'te, named Naoki Yoshida. Yoshida : This is the version we showed to the press at E3, it's only optimized at 15% and the graphics quality are only at 85% so please keep that in mind, the definite version is actually far from this one. This is also his [Yoshida's] working laptop, so it doesn't have any special parts, and it's running quite smoothly. The water shaders and the flower shaders are not there yet. 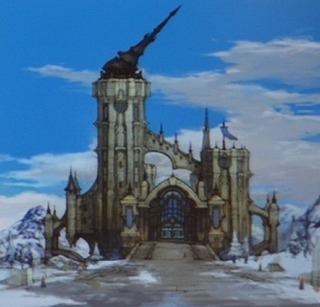 (pointing a building on the screen) That's Gridania over there. This has shadow and also the LOD is off, it is the top quality of XIV, but again, as I said earlier, it's not optimized yet, well, only 15% of it has been, so you can only see these graphics. Sage Sundi : Do you have any questions or perhaps, any comments? Yoshida : It's not connected to the server to the battle system isn't working. [Someone's voice] : There are more objects in this version, in the current version, we don't have all those sceneries displayed. We can see more details. 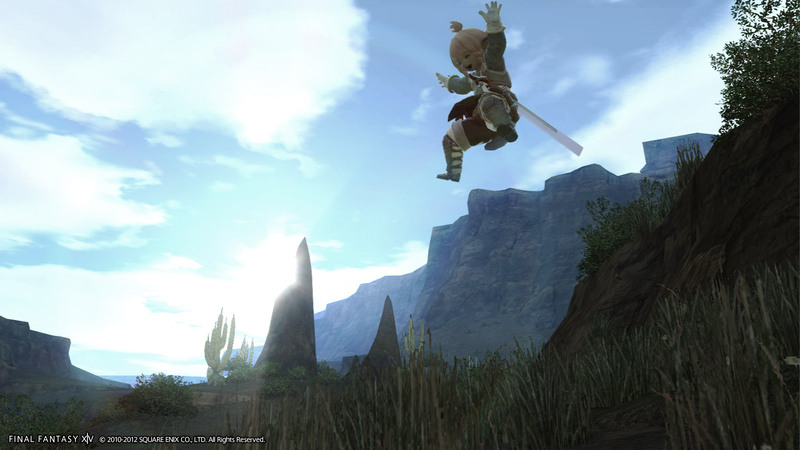 Yoshida : This is the forest, you can jump wherever you want. [Someone's voice] : We can jump! Yoshida : The jump animation is not perfect yet, it's still being adjusted. [Someone's voice] : About the shadows, will they move depending on the day time? [Someone's voice] : Is jumping everywhere possible? For instance, you hop over a cliff, and then you do not die...? The Final Fantasy graphics are too realistic, we can't really allow players to do this kind of stuff. Yoshida teleports his character in a new area, with a railroad, a kind of outpost built next to it in a far-west like environment. [Someone's voice] : We are looking forward to the alpha test. Yoshida : Thank you very much! [Someone's voice] : Will we need to trigger the Active mode in order to fight? Yoshida : We will implement a shortcut if you want to auto-attack. Target a monster, right-click it and then auto-attack will start. I hope this gives you an idea of the size of the map. Yoshida : We're trying to make it as short as possible but we can't really say how long it will take. It definitely depends on your PC's specs, for example, whether you have an SSD or a HDD, but we're trying to make it as short as possible especially for the PS3 version. We're trying to have something smooth. [Someone's voice] : You should put a Chocobo or a Moogle on the waiting screen, people will be glad to see them. Yoshida : We will make sure to put a concept art and some tips on the waiting screen so that players won't be bored waiting. You will see a concept art and a tip of the area you are entering, you will see these information before you enter, that's how we designed it. [Someone's voice] : Will the clouds move in the next version? Yoshida : Of course, of course, but at the moment we stopped the in-game clock [NdT: ZA WARUDO]. Maybe in one month you will be able to see it. [Someone's voice] : How many players can be displayed on screen? Yoshida : It really depends on your PC specs, we're not making any restriction, as long as your memory allows it and you don't mind losing frames, you can display as many as you want. You can also switch off some graphics options, by doing that, you will be able to display more characters on the screen, you can adjust for yourself, depending on your priority. [Someone's voice] : You said that the primal will only be summonable by Free Companies. Will they be roaming all over the map when they reappear? Will they always respawn at the same place, or will they respawn anywhere? Yoshida : Anywhere, you can find it anywhere. [Someone's voice] : It's better that way, else, a huge Free Company will always be keeping the primal. Yoshida : It will not happen. You need to be lucky to meet the primal. You need the luck the primal first, and then you need the power to defeat it. As long as you have those two, it'll be yours. [Someone's voice] : And then, will the battle happen on the world map, or will it be instanced? 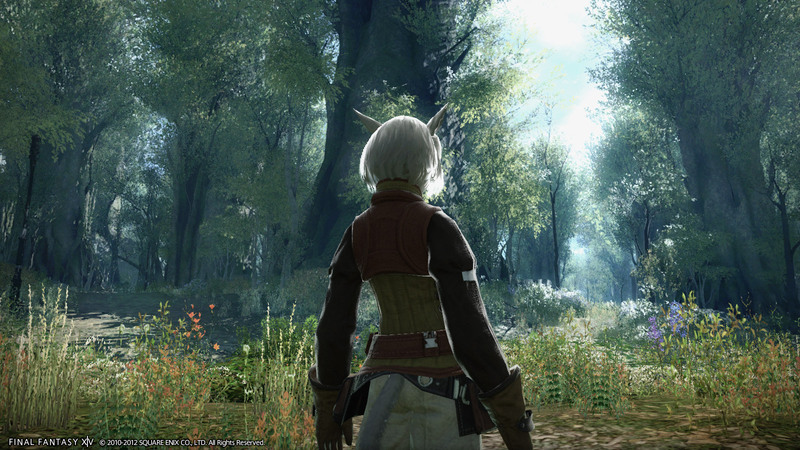 Yoshida : It will be instanced. Thanks to the Square Enix team for inviting us, especially Naoki Yoshida & Saori Hill for taking their time to answer all of our questions, Sage Sundi... for being here (well, he didn't say much...), and of course, Youmukon who gave us a warm welcome. The interview ended with a "let's take a picture with Yoshida" session, and they gave us some goodies, a handsigned printed art, a pouch, and a Moogle mini-towel. Also, thanks to the JeuxOnLine staff for having prepared the interview beforehand, and I also want to thank myself because no one will if I don't. Later in the day, Yoshida went on stage and talked about Final Fantasy XIV. We did not learn anything very interesting, but I'll try to sum up somehow. He's 39 and joined Square Enix in 2004. Before XIV, he worked in the dev team of some Dragon Quest (including the incoming Xth episode), and even before, he worked on Hudson's Bomberman. He called 2.0 "a rebirth" of the game, and claimed with a lot of enthusiasm that "Final Fantasy XIV is the most beautiful MMORPG". 1.23 will be released at the end of this month. There will be a XIV cosplay contest on Facebook, further details will be given later. Should you copy this interview, please mention the source. 767 joliens y jouent, 1260 y ont joué.